Committed to achieving its objective of creating a conducive business environment in Nigeria, the Presidential Enabling Business Environment Council (PEBEC) chaired by Acting President Yemi Osinbajo, SAN has approved a 60-day national action plan to push through short term reforms. The Acting President, who addressed journalists after the Council’s meeting attended today by the Senate President, Dr Bukola Saraki and Speaker of the Federal House of Representatives, Rt. Hon. Yakubu Dogara at the State House, said the Council will within the stipulated period focus on areas that will not only deliver tangible changes for SMEs but also help improve Nigeria’s entire business environment within the shortest possible time. According to Prof. Osinbajo, “we are trying to improve the business environment in three broad respects; the entry and exit of goods; entry and exit of persons into Nigeria, and then general government transparency- transparency and efficiency in government agencies, parastatals. Prof. Osinbajo said the renewed synergy with the legislature was to ensure that all the necessary legislations relating to the reforms were passed by the National Assembly. He added that the expected outcome of the new plan will be noticeable in improvements in all the key areas of government that facilitate trade and commerce. According to Acting President Osinbajo, “there are improvements which we expect to see at our ports. Improvements at our airports, improvements at the seaports, improvements in immigration visas etc. In his own remarks, the Senate President, Dr. Bukola Saraki stressed the importance of the executive/legislature collaboration in creating a conducive business environment for both local and foreign businesses in Nigeria. The senate president, who commended the efforts of the executive, said the National Assembly would look into some of the issues that it could to improve the business environment in the country. 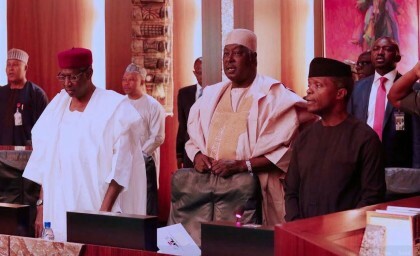 The Senate President and Speaker of the House of Representatives led the leadership of the National Assembly to the expanded meeting of the PEBEC. Also present at the meeting were federal ministers who are members of the Council including the Attorney General & Justice Minister, Abubakar Malami, SAN; Industry, Trade and Investment Minister, Dr Okey Enelamah; Power, Works and Housing Minister, Mr Babatunde Fashola, SAN; and the Information and Culture Minister, Alhaji Lai Mohammed. Other members of the Council including the Comptroller-General of the Nigeria Customs Service, Col. Hammed Ali (rtd), the Comptroller-General of the Nigeria Immigration Service, Muhammed Babandede and the Managing Director of the Nigerian Ports Authority, Hadiza Bala Usman, attended the meeting.